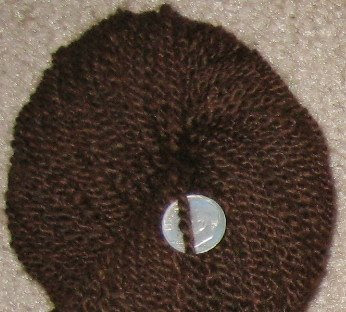 I'm spinning an eyeball 50/50 blend of the Polwarth (a gift from a friend a long while back) and Huacaya Alpaca (the same that I used for my Teddy Bear Shawl). You may remember the next two photos from an earlier post. 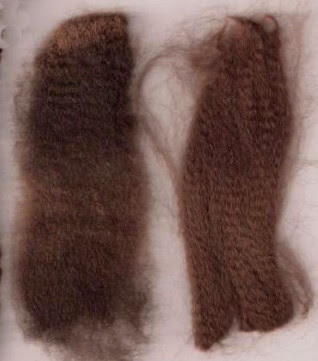 In the next one, the Polwarth is on the left, the alpaca is on the right. Staple length is 4 to 5 inches for both. You can read my complete assessment of the Polwarth in this post. 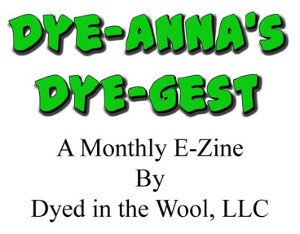 I am blending the two fibers the same way I blend colors on woolcombs as seen in this post. I find it faster to simply spin it off the comb rather than to diz it into top. My plan is to use this to weave fabric for a winter jacket or coat. I don't have the details figured out yet, but I do think about it while I spin. Since I want the coat to be solid color, I'm thinking that the interest will have to be in the weave of the cloth, as well as the garment design. I've only got three skeins finished so far, and while I don't know the exact yardage I'll need, I know it will be a lot. So this will be my spinning project for this winter. Hopefully by spring, I'll be ready to move on to the serious planning stage. I would never have thought to weave from my Forsythe combs and it takes sense. Noe I'm trying to think of something to blend so I can try it out. It's looking awfully good so far. I'll be interested to see what weave structure you chose. Always the painful part is loom waste when you're using handspun yarns. Re Sharon's comment---a dummy warp will solve the loom waste issue. What an ambitious project you have taken up! I cannot imagine spinning that much of one fiber. As in weaving, repetition in spinning drives me mad. That's why I love multi-colored and or textured batts or rovings. 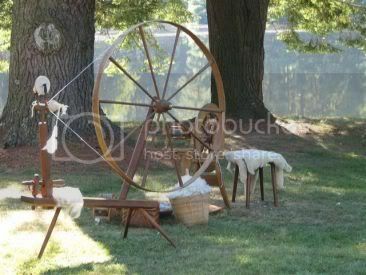 And spinning even a pound of those gets harder and harder as a wade through all the fiber..... Your coat is going to be gorgeous. The two fibers really look great together. I can't wait to see what the finished fabric looks like. Those two fibers look like they were made for each other ... what a lovely first dip into this project, I can't wait to see it on the loom! Leigh that is a beautiful yarn structure.I have not used combes before and am going to give that a try in the future. I am still wading through the jacobs fleece but the different colours are beginning to sing to me. Combs are def on my wishlist. Your Pol-paca yarn is beautiful . . . that deep, rich brown. Yum! I'm sure if anyone can spin the yarn and weave the fabric for a jacket you can. Always fun to have a project in the making. I love the shade of brown. It would look great it a jacket. That blend will make a fine coat Leigh. Looking forward to watching it happen. I've not yet tried spinning off the comb...you must feel very confident with them! Oh - how gorgeous! I can't wait to see how spinning from the combs works. The yarn looks so lovely and I am sure when woven it will look stunning. Many years ago when I did a little bit of weaving-very very basic- I tried spinning silk for a handwoven piece of fabric and it took forever! So I am stunned by the hours of spinning you have ahead. Dont forget to gt up every 20 minutes and have a stretch. Spinning off the combs is the impatient person's way to do it. The only reason I do it is because I have mini combs. No way I would try this with full size combs! The only disadvantage I can think of, is that I have to work more to control the size of the yarn; dizzed fiber is a nice consistently sized top. Peg, I have to agree with you about repetition! Which means I'm not sure how quickly I'll finish the spinning part of this project as I may need to take a break or two occasionally. I will definitely use a dummy warp with this. One of the reasons I don't weave with my handspun is the waste! Helen, thanks for that reminder! It looks so soft I just want to reach into the computer to touch it. I love the color and can't wait to see what you weave.